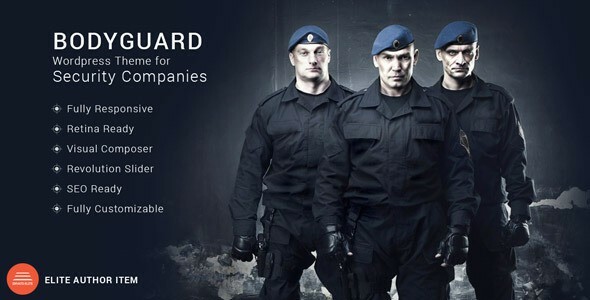 Bodyguard is WordPress theme designed for security companies solutions and security firms powered by an elite author, Bodyguard provide many features to create your own company website easily without writing any line of code. Responsive layout : This theme is responsive to give a perfect user experience on all devices. Boxed or fullwidth : this can be easly from our theme settings panel. Built by Zurb foundation 5 : Built by Zurb foundation 5 the professional choice for designers, developers and teams. Premium Plugins : Visual Composer plugin included â€“ This theme includes the Visual Composer plugin, saving you $30. Contact Form 7 plugin support : This theme includes styling for the Contact Form 7 plugin. Demo content Included : You don’t need to mess around the XML Files and missing content we built a Deomo content importer inside theme options to get the your website like our demo by one click demo installation. WooCommerce Ready and WooCommerce Sidebar : BodyGuard is 100% WooCommerce compatible and also includes full design integration that looks amazing!! Item Reviewed: Best WordPress Theme for Security Companies 9 out of 10 based on 10 ratings. 9 user reviews.